Fri., April 6, 2018, 3:50 p.m. Steady and sure-handed, Minnesota Twins second baseman Brian Dozier is a confident mitt man. But the Gold Glover didn’t feel that way this week, standing in the snow globe of PNC Park in Pittsburgh. 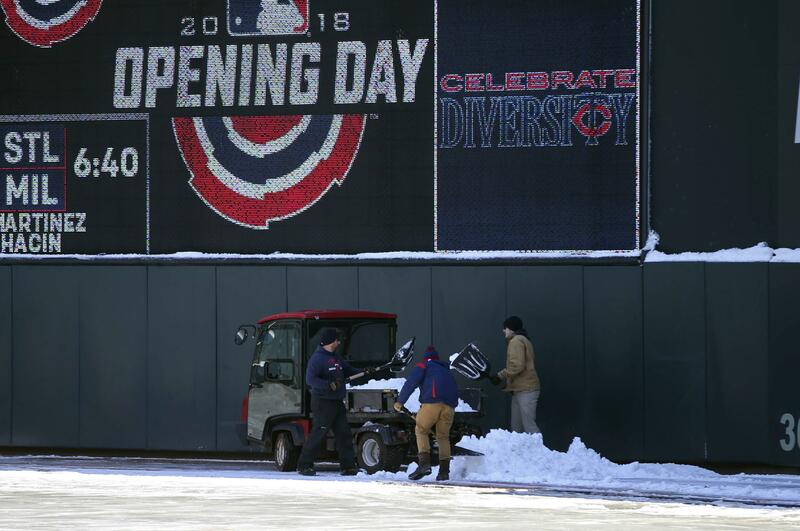 From Yankee Stadium to Great American Ball Park to Comerica Park, the big winner so far this season is the wintry mix: eight games already postponed amid a chilly spring and several others held in frosty settings. Players and fans might not catch a break anytime soon, either. The weekend forecast in several spots is for weather better suited for throwing snowballs than pitching baseballs. Snow is predicted at Coors Field in Denver, Nationals Park in Washington and the Bronx. At Target Field in Minneapolis, there’s an outside chance Seattle and Minnesota could play the coldest game on record in major league history. The current mark is a first-pitch temperature of 23 degrees when Colorado hosted Atlanta in 2013. Mariners manager Scott Servais said the heated benches and hot air blowers will help. “Mind over matter. If you don’t mind, it shouldn’t matter,” he said. Maybe, said Boston outfielder Mookie Betts. It was barely above freezing at Fenway Park as he tried to limber up before Thursday’s home opener against Tampa Bay. “It’s cold. You keep trying to play mind tricks, but it’s still 40 degrees. No matter how much you say ‘mind over matter,’ it still matters,” Betts said. Red Sox manager Alex Cora wore three layers and a jacket for the game, which the A.L. East champions won 3-2 in 12 innings. “It’s funny because it’s cold in April, but it’s never cold in October. And the weather is still cold in October. But it’s something about it in October we don’t care. And in April we do,” he said. “Where are we shooting to go? It’s going to be cold in October. This is a dress rehearsal,” Cora said. The season began on March 29 and marked the earliest start date in the majors, excluding special openers in international sites such as Japan and Australia. As part of the labor agreement between players and owners, this season will span 187 days, instead of 183. That will allow for extra days off and more room to reschedule makeups. It also sets up for Game 7 of the World Series, if needed, to be played in October, rather than November. Chicago White Sox general manager Rick Hahn admits it’s tough to see games played in flurries and frigid conditions. He also said the additional four days off will benefit teams later in the spring and summer. As in, no going back to a 154-game schedule or adding in a bunch of doubleheaders. MLB has tried to adjust the schedule in the past to have teams with warmer climates and indoor parks play first. A lot of them did open at home this year, including the Los Angeles Dodgers, Arizona, San Diego, Miami, Atlanta and more. But some openers are bound to be in New York, Kansas City and Detroit. Plus, not every club wants to begin with a week on the road. The Tigers are playing their first 25 games in Chicago, Cleveland, Pittsburgh and Comerica Park. “You’re not going to get me to criticize Major League Baseball. I’ve already seen my face enough on TV,” said Detroit manager Ron Gardenhire, who was ejected on opening day. In the meantime, players do their best to cope. White Sox teammates Leury Garcia and Yolmer Sanchez said they slathered Vaseline on their bodies to keep warm. Earlier this week, a few Mets built a snowman at Citi Field – balls for buttons, bats for arms – after their game against Philadelphia was called off. It was 42 degrees for Washington’s home opener Thursday, an 8-2 loss to the Mets. “Your hands being cold. Gripping the bat. I mean, that’s probably one of the hardest things,” Nationals star Bryce Harper said. The wind chill factor was in the 20s on Wednesday night in Pittsburgh, and snow fell on and off all game. The announced crowd was 20,186 – even with a $1 ticket promotion, maybe there were 10,000 people inside the park. Twins closer Fernando Rodney closed out a 7-3 win. At one point, he tilted back his head on the mound and caught flurries with his mouth. Published: April 6, 2018, 3:50 p.m.